Double Standards: Who Owned The St Albans Psalter? ‘Psalm 105’, St Alban’s Psalter: Hildesheim, Dombibliothek, MS St Godehard 1, p.285 (public domain). In 2003, the St Albans Psalter (Hildesheim, Dombibliothek, MS St Godehard 1) was digitised and published online. The project was managed by Jane Geddes, and funded the Arts and Humanities Research Board and by Aberdeen University. This electronic publication marked a significant moment in scholarship on women’s literary culture in post-Conquest England. As early as 1960, Francis Wormald suggested that the St Albans Psalter was produced for Christina (c.1096-after 1155), a former recluse and the founding prioress of the small religious house at Markyate in Hertfordshire. In their commentaries on the psalter that accompany the digitised text, Geddes and her team argue forcefully in favour of a strong connection between the psalter and Christina and the Markyate community. 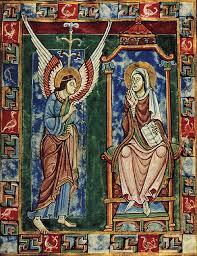 Geddes subsequently published a British Library book entitled The St Albans Psalter: A Book for Christina of Markyate. The case for female ownership of this stunning illuminated psalter had been made. In my current project on early medieval women’s literary culture, I look again at the St Albans Psalter alongside the anonymous Life of Christina of Markyate in order to think about works written by and for women who lived ‘through Conquest’ (to borrow from the title of Elaine Treharne’s recent study. I previously wrote about both of these works in my book Medieval Women’s Writing. My reflections in this post arise from my reading of the most recent scholarship on the psalter by art historians, archivists, and historians. The St Albans Psalter is an exquisite codex. It contains breathtakingly beautiful brightly coloured images, many of which are the work of the so-called Alexis Master. The cycle of Romanesque miniatures that illustrate the Life of Christ are exceptionally striking, enlivening the Biblical figures with carefully drawn gestures and subtly eloquent facial expressions. The women in particular stand out because of the care and attention given to their detailed portraits. The psalter’s Annunication image is a case in point. I chose this miniature for the cover of Medieval Women’s Writing for several reasons, not least because the representation of the Virgin Mary is so astonishing. This miniature is dominated by the figure of Mary on the right hand side of the image, seated in a position that occupies space in a manner now more often associated with male entitlement, the enviable muscularity of her lower legs revealed through the diaphanous folds of her garment, her right arm raised forcefully as if it were she who is uttering a proclamation to the angel Gabriel, rather than vice versa. Mary’s gaze is steady and direct and she holds a book in her left hand, its open pages facing outwards. Gabriel himself, depicted in profile, almost seems to be retreating from, rather than approaching, this compelling, confident, female presence, his right foot edging tentatively out of the frame. I discuss this image here, not because in itself it provides uncontroversial evidence of female ownership of the St Albans Psalter, but because even the most casual viewer of this single miniature cannot fail to see the extraordinary power of its portrayal of Mary. Such a visual representation of a woman of immense authority would, without a doubt, resonate with someone like Christina. We know from her Life that she resisted tremendous pressure from her parents to consummate her forced marriage, endured agonising torment when living in hiding for many years in the corner of a hermit’s cell, but was able to overcome these barriers to gather around herself a following of devout women and to establish herself as the trusted confident of Geoffrey, abbot of the important and influential monastery of St Albans. The evidence in support of the claim that the St Albans Psalter was given to Christina (most probably by Geoffrey of St Albans, possibly to celebrate her profession as a nun) and owned by her community is manifold. The psalter’s calendar includes a reference to the foundation of Markyate Priory in 1145, and obits for Christina and several members of her family, as well as for the hermit Roger, with whom she resided for so long (Roger was a revered member of the St Albans community). Two historiated initials in the psalter appear to depict Christina and the monks of St Albans, one of which, the so-called Christina initial (illustrating psalm 105), was evidently pasted into the psalter at a later date. The psalter also includes a discreet section, the Alexis quire, which may have been written by Geoffrey and which seems to allude to his relationship with Christina. This quire includes, inter alia, the famous letter from St Gregory in which he praises the use of iconography as a means of teaching those who are unable to read. This may have been directed at Christina, whose literacy was probably quite limited. We know from the evidence of the incomplete Life of Christina of Markyate that the recitation and contemplation of the psalms were central to her devotional practices, so a psalter such as this, in which the written text is accompanied by beautiful images that can be gazed at, touched, kissed, and meditated upon, would seem the perfect gift for her. Fascinatingly, stitch marks around the illustrations indicate that at one point protective curtains were added over the images. Yet, despite the overwhelming evidence of a strong connection between the St Albans Psalter and Christina of Markyate, the last decade has seen a proliferation of scholarship dismissing or moderating this viewpoint, some emerging from further collaborative research initiatives, such as a conference about the psalter held in Hildesheim in 2009, and a re-examination of the manuscript by academics and conservators at the J. Paul Getty Museum in 2012. A bibliography of just some of the work published after the digitisation project was completed is available here. A number of counter claims concerning the production and ownership of the psalter have been made, including suggestions that the book was produced for Geoffrey of St Albans’ own use, that it was produced for the St Albans monastery as a community, or that it was produced for the hermitage of Roger of St Albans. Some scholars acknowledge that the links between the psalter and the community of women at Markyate exist but believe that they are weaker than previously assumed, positing, for example, that the codex only came into the priory’s possession after Christina’s death when an attempt was made by the monks of St Albans to promote her cult. The arguments against Christina’s own possession of the St Albans Psalter centre on two key points. The first relates to the dating of the Psalter, which ranges anywhere between the 1120s and the 1150s or even later. Only an early dating would allow for the oft-cited suggestion that the psalter was presented to Christina by Geoffrey of St Albans when she became a nun in around 1131. A late dating of the manuscript (in its final form) would render it impossible for it ever to have passed into her hands. The second point relates to the monetary value of the St Albans Psalter, undoubtedly a luxury production, and the relative impecunity of the modest Markyate Priory. ‘Would such an expensive book be given to such a humble house of religious women?’ is one question posed by the sceptics. Christina was really quite an obscure figure, so the argument goes, and any attempts to promote her cult at a local level (as evidenced by the writing of her vita) were short lived. If it were not for the chance survival of a manuscript containing her incomplete Life, she would have vanished into an almost total obscurity. Reflecting on these more recent counter-arguments, I am struck by the impression that the critical commentaries by Geddes et al that accompany the digitisation of the St Albans Psalter have produced a scholarly backlash. In the face of remarkably compelling (even incontrovertible) evidence that the codex has strong connections with Christina, some scholars have been driven to construct convoluted cases to the contrary, based on rather limited substantiation. What we seem to be witnessing, once again, is a double standard of proof in relation to women whereby the case for women’s book ownership has to be established far beyond reasonable doubt but the case for men’s book ownership can be made based on the flimsiest of arguments. Undoubtedly many questions about the St Albans Psalter remain unresolved: its exact dating, the nature of its composition (is it a single codex, or a compilation? ), who commissioned it, how it ended up at or associated with Markyate Priory. What we can be sure of, however, is that it was closely connected to Christina, either because it was given to her during her lifetime (my own preferred view), or to the priory following her death (possibly in commemoration of her life). Furthermore, as her Life demonstrates so vividly, regardless of the fact that she was never canonised, she was evidently something of a cult figure. 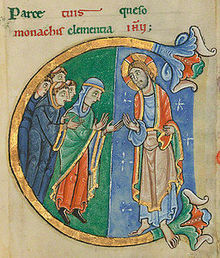 Like the Virgin Mary in the psalter’s Annunciation image, Christina of Markyate was regarded as a woman of great religious authority by many of her contemporaries. The exact nature of the association between the St Albans Psalter and Christina may be still open to debate but this much is clear: the St Albans codex is a psalter fit for a woman. The Nurse’s Tale: Histories, Archives and Forgotten Women.